Back Home in Minnesota...now what? "What's happening with your blog now that you are in Minnesota?" This is the question that seems to be on everyone's minds (including my own) since returning to the United States five weeks ago. In truth, I still haven't figured it out exactly. I am not sure if I will want to continue blogging here or if I will need to be more anonymous because of my profession. Although, apparently several of my 8th grade students this past year read my blog the entire school year without my knowledge... so there can't be that much I shouldn't be saying. Anyway, the point is this blog will have to evolve with me as I try to make a life for myself here in Minnesota. Oh wait, you thought I had a life for myself back here in Minnesota? but you think it's never gonna change." What I am in fact learning is that I have a whole lot happening in Minnesota that involves things I would typically do on vacation. I travel around - including a long weekend in Milwaukee for Summerfest concerts, a week-long family vacation to Colorado and a bachelorette weekend in my old college town of La Crosse. I go to happy hours and out to eat to re-connect with friends and family. People come into town to visit me - HI KELSI. Turns out for the past three years, and really the last seven including college, Minnesota has been a place I come home to visit, not a place I live. Now, I live here. I work here (or at least I will come August 27th!). And I am 100% in love with that...but I need to make it livable. I need routines. My friends have work out routines. They volunteer. They have people to watch Monday night TV shows with come September. They have made new friends. They play on summer kickball or softball teams. In essence they have whole lives here that haven't really had much to do with me for the last three years. As exciting and fabulous as it is to come back and re-connect with them and realize our friendship is still just as important to both of us, they have other things to do than follow me around while I try to make this place my home. 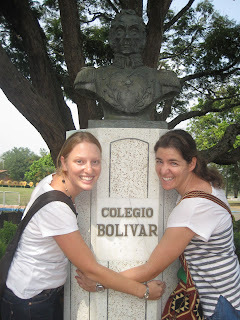 When I started this blog back in April 2009 I talked about following your dreams... At the time mine had led me to accepting a job teaching internationally in Cali, Colombia for two years. As you know, those two years turned into three years that passed all too quickly and now it is my last night in Colombia. In a few short hours I will be on a school bus (yeah, that's right) bound for the Cali airport, crossing my fingers that my bags are all under 23 kilograms and then spending a full seven hours decompressing with Stetson in the Miami airport before arriving in Minnesota tomorrow night. Most of the last few weeks, days and hours have been spent saying goodbye to people or things that have made these last three years unforgettable. But, really, how do you say goodbye to a place that will always feel more like a second home than a vacation spot and people who are more than colleagues and have become some of my best friends? In the end, we say our goodbyes, hug for longer than usual, write notes to say things we should say everyday, and try to do everything "one last time". In reality, my time in Colombia won't be shaped by my goodbyes in these last few weeks, but rather the moments and people who have shaped my daily life for the last three years. Yeah, you are just a neighborhood, and yeah, sometimes you have your flaws water shortages, but I cannot imagine living anywhere else in Cali. I love your grocery store and its employees who now know to ask for our reusable bags at checkout. I love your gym and the instructors in our spinning and kick boxing classes who have become more than just gym mates, but instead friends. I love the community you helped me build here - from the neighborhood "Boo Radley" to Carlos, the dog walker, who always has a nice word for Kelsi and I. I love your afternoon breezes, the energy of the Parque del Perro and the tranquility of the streets on Sunday mornings. I don't know if I could name two people's lives who have changed more in the last three years and you both have gone through those changes with grace and beauty. I love our travel memories - especially in the Amazons although I still do not support kayaking to Peru...I did appreciate Romolo as well as our random adventures crossing into and leaving Brazil. 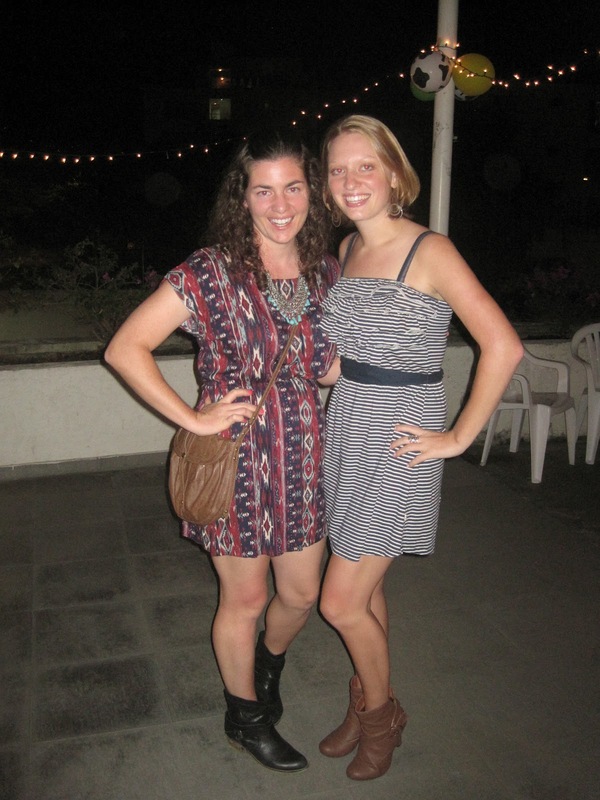 I love our Cali memories - at Platillos, dancing at La Fuente, or just riding to school together for a year. You were both constants in my life here at a time when I missed the community aspect of college and even our small group of girlfriends made the biggest impact on my lasting happiness here in Cali. Hana, me, Kelsi and Tara during a much needed getaway from the city life in Cali to the smaller town of Popayan. Kelsi, Hana and I at the going away party! Before moving to Colombia my cooking skills, while existent, were limited to lots of gluten - think bread, pasta, potatoes, etc. and not much flavor. Thanks to living with a lactose/gluten-intolerant roomie and the lack of availability of processed foods from the United States, living here has taught me a thing or two about the food I eat. I love flavors. I love making REAL fruit juices with guanabana, lulo, mango, pineapple, and mora. I love that I know how to roast a whole pumpkin in the oven. I love making all kinds of hummus. I love that I can whip up a mean guacamole and salsa in no time. I love that I make a killer quinoa salad, delicious avocado toast, and oat squares. 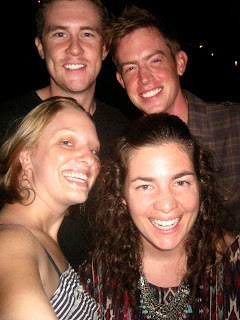 Rob, Stetson, Kelsi & I at the going away party! Rob sending me off with some lovely words at the end-of-the-year party. I cannot think of another place where I could have spent my first three years as a teacher as happy as the ones I spent here. Teaching is a hard profession full of late nights, early mornings and students who sometimes don't make you feel like it's worth it. However, after three years here I am in love with being a math teacher and the relationships I have built with my students here are a testament to that. The graduating 8th grade class just gave me a Faculty Recognition award and I could not feel more honored. Having students get up in front of other teachers, faculty, parents and their peers to make a speech about how you affected them is one of the best moments ever. Like Hana said at the Primary end-of-the-year party, where else will I work where staff parties dissolve into salsa dancing with your colleagues? Receiving the Faculty Recognition award at 8th Grade graduation. Former students who stopped by graduation to say goodbye. These boys taught me some of the best lessons about making time for building relationships in the classroom. 8th Grade Teachers at the Middle School end-of-the-year party - THANK YOU for being such a smart, talented, creative, caring and dedicated group of people to work with!!! In a bicultural, bilingual community where people are constantly coming and going, making friends with Colombians is sometimes difficult. However, being friends with Daniel was never hard. He has become the older brother I always wanted as he taught me things about school, Spanish and Colombia in general. He has been a listening ear for all my transportation complaints, valid or just ridiculous, and he always makes me laugh. Talking with him made me a better Spanish speaker and it made the experience of living abroad so much richer. He is an invaluable asset to my school and probably the most selfless person I have ever met. Daniel and I at the going away dinner at Platillos! Smizing - not sure when this became a thing we do, but I love it. Mandi, Sam and I sending Kelsi off in (Gossip Girl) style reading a poem/letter I wrote in the same tone & with the same vocabulary as the show for the Primary end-of-the-year party. This morning you left at 4 AM and afterwards I found myself laying awake in bed wondering what life would been like if I had never met you in this place at this time in my life. Later today, a friend walked into the nail place, looked around, and stopped just short of asking "Where's Kelsi?" when she saw Stetson and I there without you. It's no surprise that our colleagues make fun of us for the way we are attached at the hip and do everything/go everywhere together. What's funny is that we never planned that, we never discussed it and we probably couldn't point to the one moment when it began, but here we are three years later and damn right, I go everywhere/do everything with you. Because if I didn't - life would here would have been so much less fun. I love that you have an incredibly beautiful and unique taste in fashion/jewelry that I admire, idolize and balk at (i.e. the owls) all at the same time. Thank you for finding the recipe for oat squares and cooking entire pans of them for dinner with me on Friday nights in El Ingenio. Thank you for motivating me to learn salsa and go to classes together, even though you have more rhythm and dance moves than I could dream of. Thank you for waiting for me to get down to the cab every single morning because you are always ready before me no matter what. Thank you for being my gym buddy and celebrating with me when we both had to have a million pairs of pants taken in this year. I hope I am every bit as fun, generous, patient, giving, loving, happy, creative, and amazing as you are at 29 and every year thereafter. While our 5-year age difference has never really been noticeable in our friendship, you have always been someone for me to look up and model my actions after. While our next adventures together might be a bit more spaced out, they will be every bit as wonderful as the last three years. You are my forever friend. Saying goodbye to school for the last time there. Kelsi and I at the going away party this year.